My kitchen is painted yellow. Because yellow is the color of sunshine and of joy and because yellow is my favorite. It’s never quite as clean as I want it to be in here. Tonight as I stand in the after-bed-time quiet my eyes follow a trail of red footprints across this floor that is supposed to be white and the tears well. So many memories held here. This kitchen, this is there I serve. Many days, this kitchen is where I live. These counters, nicked and crumb covered, the sink, one side piled high with drying dishes, they could tell some stories. They’ve seen my joy as I gaze out the window at my laughing brood and raise still-soapy hands high in praise. They’ve seen the tears fall in defeat over the just-peeled carrots and the open pages of Psalms. They’ve heard my tongue snap in exasperation as another child screams through the kitchen and my whispered repentance later as I beg Him to make more of me. These walls have held late night laughter with dear friends and early morning remorse over broken dreams. They’ve held confessions and achievements and words, oh so many sweet words. The memories flood too quickly to contain them all. I see the night I came home and walked into this kitchen defeated and without a 4 year old and sweet friends gathered around to make super and their silence meant more than words. I see our first Thanksgiving here, mom pulling the stuffing out of the oven, kids dancing happy and people – oh so many people – who I love and so much joy spilling out of such a small space. I see myself standing here in the wee morning hours that shouldn’t even count as morning yet whisking high calorie milk for a child just barely clinging to life and I hear my loud cry for Jesus to save Him. I hear the pitter-patter of little feet over the bubbling of the coffee pot and the excited voice of my littlest as she announces that the chicks have “popped” in the first light of the morning, and I feel the way His mercy has washed over me in this place. I see hundreds of cooking lessons, little bodies crowded around a big pot, eager for their chance to measure, to pour, to stir. I see birthday cakes, so so many birthday cakes frosted and decorated with butterflies and flowers. I see whole wheat bread warm and rising in this oven, daily, and marvel at how He has been our daily bread. I see the day when the full weight of her past threatened to knock the breath right out of me, how I pressed my palms hard into these counter tops and willed myself to keep breathing and questioned everything that I knew to be true. I see the girls, gathered around the open computer screen and hear the voices of my mother and father and brother streaming across space and time zones and my heart aches with missing them but rejoices for love that bridges even oceans. I see people. Homeless mothers who have found their way to better life here. Children who have healed and become whole here. Friends who have found rest, family who have so greatly blessed, people I have loved, who have loved me. People who have known the Lord in this place. I have set foster babies on these counters next to casseroles for neighbors. And right here on these counters I have typed it all out, our lives, the beautiful and the ugly, between the stirring of the pots and the wiping of the noses, and the words turned to pages and the pages into a story. It’s almost too much this passing of time, the dying of dreams and the budding of new ones, this growing of babies into children and children into women and hearts to maturity. And I cry because I want to hold it all forever, His goodness in this place. I run fingers over knife-worn counters and time runs too fast. And people are sent out from here. People heading home and people heading off to new futures and one day, these girls, too. I serve meals in this kitchen but I want to serve them what counts. I want to offer them the living bread, the only food that truly fills. I have laughed here, I have wept here, I have created here, oh, I have prayed here. And here in this place, I have known Him more. I haven’t always done it right and some days I feel that I haven’t been enough, but I know that He has. He has. Right above the oven are painted the words of Acts, “They broke bread in their homes and ate together with glad and generous hearts… and the Lord added to their number daily those who were being saved,” and I know it like I know my own breath and the warmth of the sun on my skin, time passes, and they will go, and only He will remain. Thank you for this one. I know our lives are so different, yours with your little girls in Uganda, mine with my schoolbooks in Arkansas, but I know what you mean about wanting to give people the bread that matters. May God help us both to obey, no matter what is placed before us in the days ahead. Blessings on you, Katie! So thankful to read this blog and be encouraged and to pray more encouragement over you. Today God brought to mind the book "Practicing the Presence of God" by Brother Martin. He talks a lot about the kitchen of where he lived as a monk. It's a great little read. Just thought I'd mention it. If I had your address in Africa, I would send it to you! If you want to email me your address and allow me to bless you with this book, let me know. My email is passion4hisglory@gmail.com. Lifting you up tonight, my fellow Katie, sister in Christ, and servant of the Gospel! May His grace & love abound to you greatly today. In tears as I sit here in a coffee shop in College Station, TX, trying my hardest to focus on studying for my test tomorrow. Yet, all I want to do is take off on a plane and fly to Uganda and show precious children the love of the Father. Praying for you and your sweet family and kids and desperately desiring that so many people would come to know the real and infinite love of Jesus through you. In tears as I sit in a coffee shop in College Station, TX while trying my hardest to focus on studying for my test tomorrow. Yet, all I want to do is get on a plane and fly to Uganda to show those precious kids the love of our Father. Praying for you and your sweet family, kids, and community and desperately desiring that every one of them would know the Lord through you. You captured the heart and soul of so very many mamas with your words. The places and circumstances may differ . . . but the hearts of the mamas are so very much the same. Be BLESSED this day . . . and always! I am blessed Katie, every time...you've done it again, no HE has done it again through you. God bless you like you bless those who read your blog. Thank you for giving me my 8th thing I'm thankful for today that I am just about to record in my thankfulness journal. Tomorrow I will complete the sale of my home. It’s such a cute house – complete with a yellow kitchen :). I got to this place through a long set of circumstances – losses, a calling to what people call “throw-away” kids here in the States, and God’s leading. I’m selling my home and stepping out into full time ministry on faith. For the last decade I’ve tried to balance working with the kids and families God’s called me to while earning an income. And while I feel like I’ve been obedient, I know God has called me to more. So, here I am. Almost 30, essentially penniless, and living with relatives so that I can take kids to the doctor, help feed and clothe them, LIVE life with their families, and mentor/tutor/counsel them. And while it's crushingly hard at times, I LOVE it! I can count on one hand the people who really understand what I’m doing and support it. But, it doesn’t matter. I know God is leading me here – to this place – to this season. This is where God wants me. When God first nudged me to sell my house and give up most of my possessions, He used your blog to help me be obedient. I went back to the beginning of your blog and read through your journey – crying when I read some of your struggles and feelings about surrendering to Him. Now, I know living in Uganda with 13 little girls and hundreds more you call family is not even close to what I’m doing/experiencing. But, please know that I deeply appreciate your obedience to God’s calling on your life. You have helped me to do the same. Thank you for opening up your heart here. Your words are a powerful reminder and encouragement. Keep being a light! This is beautiful. It brought tears to my eyes. You're heart for people and the Lord is truly beautiful. Please know that I'm praying for you, everything you do, and everyone you met. You a truly an inspiration, even in the little things. Thank you for sharing you heart. Beautiful, Katie. Your love for Jesus inspires me to love Him more. Oh Katie, I cried through your beautiful post. While I do not have as many children as you do, and my life is different in so many ways, I resonate with your words. You are a mother who loves her children and the Lord and clings to them every day. We mothers could not get through our days without the Lord. And raising loving children to adulthood is our goal. I beg God to keep them safe and to heal them and to help me love them perfectly. But so much more, I want them to love Jesus and reflect His love to their world. Thank you for your words. I pray for you often and thank you for what you teach me. what is more beautiful than your words is that your heart for the Lord is so clear in your writings. i can practically feel the desire for more of Jesus coming out from my screen as i read this post. thank you for being real in your struggles & your praise. it truly is an amazing picture of the strength that we are given through Jesus. you're such an inspiration! may you continue to serve Him to the least of these. prayers! Thank you for being so real, so honest. I can see your life, the good, the pain, the joy, and the faith. All of your blogs seem to be just what I need to hear and the perfect time. Thank you for serving and trusting God and encouraging all of us to do the same! Thank you for your continued inspirtation. As my husband and I hear Gods call for us to South Sudan, we find great strength in your words and reminders. I too love yellow because it reminds me of sunshine and joy. I will be in Uganda, January 2013, I've just read your post and it makes my heart long for those beautiful children. Praying for your family that God will continue to bless and protect your family. I don't know you but the spirit of a kindered heart is so present. Your heart for Jesus and for the beautiful people of Uganda inspires me. I am a 21 year old Wheaton College student studying to become a Nurse... I so often think of the inabilities I have to serve Him and think I will be more equipped once I have a degree in Nursing..... each post of yours reminds me how HE is the Creator and HE is capable of using Us... just us... just how we are... to serve HIM and HIS people. I love hearing about your Ministry. You are an inspiration to all. Keep seeking HIM... praying for you from Chicago! Thank you Katie, for your transparency that so magnifies Jesus. Your are serving Him one precious life at the time. God bless you, strngthen and keep you. You are such an inspiration to my own walk with Christ. I admire the way you live so radically for Him. It is so hard to let go of the things here in the United States that create for us a false sense of safety. Thank you for serving Christ and for sharing your story with others. I'm currently the Youth Minister at FBC Brinkley, AR in the heart of the Arkansas/Mississippi Delta. I have several incredible youth, but one has really shined lately. She's currently a junior in high school, but she's already been on multiple mission trips to the small Central American country of Belize. She has your book and you, and of course the words of our Lord, have inspired her to answer the call to full time missions. She has no doubt that she wants to be a missionary! Thank you for showing young girls here that it's OK to give up all the hopes and dreams of an American girl to live a life for Christ. You are doing an amazing thing! I have been on this earth 57 years and yet your comments remind me that I have not lived as much as you. I pray that God continues to work thru you to bring blessings to your family and all those that you come in contact with. I know that by using you to be a blessing to others that you will be most blessed! Your heart is so very open and honest. Thank you for your thoughts. You inspire....because your heart for HIM is so very apparent. Your openess to heartache and laughter pure joy and failure all wrapped into one. Praying for you sister in Christ. For you to be filled with more of Him. For me to be filled with more of Him. It's beautiful, isn't it, the way a room can hold so much love in it, so much history, so much blessing and grace, so much of Him that every breath in there feels full? Thank you for this, Katie, and for your surrender, for all your step by step yeses to the glory of God. You are absolutely serving up Him, always Him most. love reading your blog and hearing of your times in Uganda. The Lord is doing something mightily with your life! Praise Jesus! The book you wrote is beautiful and I have shared it with many. Katie, I just finished your amazing book. Wow.... I couldn't put it down. I cried and I rejoiced. Your story is so awesome. I do one week of mission work a year and I LOVE it. This year I spent a week in the jungle of Panama telling the children about Jesus Christ. I am a teacher of special needs children in a small area of South Eastern, PA. You will be in my daily prayers. Your work and love for Jesus are such a gift to me. God Bless you and your beautiful children. You and your family will be in my daily prayers. God Bless You, Katie! But whatever was to my profit I now consider loss for the sake of Christ. What is more, I consider everything a loss compared to the surpassing greatness of knowing Christ Jesus my Lord, for whose sake I have lost all things. I consider them rubbish, that I may gain Christ and be found in him, not having a righteousness of my own that comes from the law, but that which is through faith in Christ--the righteousness that comes from God and is by faith. But whatever was to my profit I now consider loss for the sake of Christ. 8 What is more, I consider everything a loss compared to the surpassing greatness of knowing Christ Jesus my Lord, for whose sake I have lost all things. I consider them rubbish, that I may gain Christ 9 and be found in him, not having a righteousness of my own that comes from the law, but that which is through faith in Christ--the righteousness that comes from God and is by faith. Uplifting to read your blogs! Oh, there are no words Katie to tell you how your words inspire me and touch my heart. Prayers for grace and strength as you continue in this life changing ministry to both you and those you serve. Blessings abundant! i hear God through your words. hold onto your joy and your faith and i pray that God give you so much peace and love in your journey on this earth. i look up to you in your obedience to Him, and i pray that God be able to use me as He is using you for his kingdom.. Praise Him always, I thank Him for you, and I love you sister. Wow. Katie, your posts always leave me speechless and with a hunger to share His love and grace more and more with these people I'm surrounded by. Thank you for being such an example to me. You're an encourager more than you know! God bless you! Wow, I just found your blog and was inspired. You and your crew of daughters are beautiful. I myself am a governess on remote sheep and goat station in Australia, and the parents of the kids I teach let me tell the kids bible stories and teach them what I know about Jesus. What i do is nothing like what you do, but I prayed today I could be a witness to my students like you are to yours. God bless you and yours. Lots of love. Just started reading your book today and was captivated by the first chapter. The line that you wrote "Jesus wrecked my life" is so incredibly relevant to my life right now and you wrote the words perfectly. So blessed to be impacted by your journey and all that God is doing in your life! So true. When they say time flies they don't say how to slow it down regardless of the moments of rocking babies willing time to stand still, to cherish the moment, and relish the sweetness...time flies and one does wonder if we have not only done the good stuff of life but given them The One who is life. Beautiful Katie. Just beautiful. I have been there myself in different ways and I wonder if we all served You will this world be still broken? Thanks for sharing! Beautiful Katie just beautiful. Thanks for sharing. yes.thanks for sharing. praying in my kitchen for the exact same thing. I am continually encouraged by your faith, perseverance and courage to do the impossible. I am serving in west Africa and somehow some way God has a way of knitting hearts with those who serve on the same continents. Each time I read your posts I am reminded of the hurt and pain of some of the children in our village and this opens my eyes to the grace needed to love those who are brats most of the day ;). You are an inspiration. Doors and windows, Katie...Doors and windows. You are truly an inspiration. Doors and windows, Kaite....doors and windows. Love you, Katie. SO good to read your words and "see" the pictures you formed with them in my mind's eye. Your kitchen, your home, your heart...all so full of love! You are never far from my mind and I continue to pray for His sustaining grace for you! This entry gives me such peace, hope and the yearning for all things to be made new by God. I love the glimpse into your lives - the beauty as well as the hard reality. I have to say that I was relieved to read that even you may snap a word here or there at your children. Not because I'm glad you did it, but because it reveals the fact that you truly are human! :) This week I found myself whispering the same hurt cry of repentance and yearning desire to be more. I'm reading through your book now. God is truly using it to guide me as I've been placed in a leading role for our orphan ministry at our church. When everything seems so vast and I'm told that people will be looking to our ministry, all I can say is that we have prayed - a lot! I read your book and am so encouraged to just continue in the compassion He has blessed me with. I am never enough, but He is my strength. So beautiful...I sit here halfway across the world, but can so vividly see you in your kitchen from the words you paint across the page. Thank you! Katie,your faithfullness continues to amaze me. You learned at a very young age what takes many of us a lifetime...He is all we need. Prayers for you as you endeavor to love these precious people. Katie- this is beautiful. As I sit here at my work desk in Orlando, Florida and read your words I am moved to tears. What a calling, what an amazing calling you have on your life. Continue trusting. Your life is so beautiful in all of it's wildly colorful ways. Katie, all those memories--reminders of life lived well. Nice to meet you, Katies. "Then David the king went in and sat before the Lord and he said "Who am I, O Lord God and what is my house, that Thou hast brought me this far?" God is faithful and has brought you thous so far. He will continue too. thanks for sharing your life, your struggles and your heart. You are such an amazing and inspirational young lady and I am thankful that God showed your heart where he wanted it to live. Estou lendo seu livro... Tenho me dedicado a uma pequena obra missionária na Amazônia (sou brasileira) e é curioso como me vejo no seu livro. Como por vezes não tenho medo da imensidão do rio Solimões e tremo ao ver uma barata. Mas o que mais me atraí no livro é sua mudança enquanto pessoa. É impossível permanecer igual quando o amor de Deus, simplesmente, explode em nossos corações. Acabamos mesmo por nos sentirmos estranhas quando estamos na nossa Terra (sou do Estado de São Paulo, mas há cinco ano moro no Estado do Amazonas). Linda, que Deus te abençoe, te use e te dê sabedoria em tudo... Suas filhas são lindas e estou apaixonada pelo seu trabalho. E sobre seus pés vermelhos, lembre-se "quão formosos são os pés dos que anunciam as boas novas" (Isaías 52.7). Um beijo mamãe katie!!!! I'm reading his book ... I have devoted myself to a little missionary work in the Amazon (I'm Brazilian) and is curious how I see myself in your book. Because sometimes I'm not afraid of the immensity of the Solimoes River and tremble to see a cockroach. But what attracted me most in the book is its change as a person. It is impossible to stay the same when the love of God simply explodes in our hearts. We just feel weird even for us when we are in our Earth (I am the State of São Paulo, but five years ago I live in the state of Amazonas). Linda, may God bless thee, and give thee wisdom use in all ... Your daughters are beautiful and I am passionate about her work. And on his feet red, remember "how beautiful are the feet of those who bring good news" (Isaiah 52.7). A kiss mommy katie!! As always, beautiful & inspiring. God's Blessings, Katie. you did serve them Jesus. It's all Jesus. you are doing it. it's a beautiful fragrand aroma to God all bathed in love and faith, you inspire others, you inspire me-- to let go and give God my life. I am saved totally completely born again but I desire to let go of all this stuff and LIVE for God and serve "them" Jesus. Exactly what you said, exactly. Thank you so much Katie for always pointing me back to Jesus. I love reading your blog and hearing about your ministry. I will keep on praying for you and your children. You truly are an example of what Jesus can do with one who is surrendered to him, and how our beliefs shape how we live our lives. Praise the Lord! Katie I love what you write! I love your book so much! I want to donate to your "God work" with children, women,health,life and love. I love that even in the mundane, you see Jesus and encourage me to do the same. That you don't confuse humanitarian work as a substitute for a deep relationship with God. That you see physical needs, but do not neglect spiritual ones. Rich blessings poured out on you! O Lord Jesus, please hear and accept my prayer. I pray this moment for Katie Davis and her girls and her family of staff and community. I pray for their mission, health and well being. I pray the words You stated in John 4,"I have food to eat that you know nothing about. . . My food, is to do the will of Him Who sent Me. . ." O Jesus, as Katie writes about her kitchen and all the food she has prepared - for her own family, for guests, for the entire community, I know she is providing more than a nutritious meal; she is serving YOU!! You are the Bread of Life! As Katie feeds meals, she nutures souls. She loves. She shares. She cares. She upholds. She extends her hands of faith. And though we (who are physically apart from her kitchen) cannot share in a meal of soup and bread, we do get to share and taste YOUR goodness and grace through the words that Katie writes. Continue to bless Katie and her daughters and Amazima and the community there around her, and the world as we share in YOUR work done through her! As Your food is to do the will of the Father, I pray that our food would be likewise! In the glorious and precious Name above all names, Jesus Christ the Lord, I pray now and forever. Amen and amen!! God in you is AMAZING, Miss Katie! God is AMAZING in you, Miss Katie! You're incredible Katie! Your story is amazing! I'm a geography major about to graduate and am currently taking Geography of Africa. My term paper is on YOU! :) And adoption in Africa. I'm reading your book right now and am simply in awe of your sacrifices and love for the Lord. What an example of our Savior. :) Thank you for your example and for sharing your light and life! I love your unashamed love. For too long, I have hidden how I truly feel about the children in my home and in my heart. For too many years I haven't really told people what I know is true about my Lord, and His love for me. You give me courage to start telling the story. How I wish the world knew that God moves heaven and earth for us when we only want to obey Him. I love you, Sweet Katie, and will be praying for you today. Anna...I am on the same journey. At 47 leaving this life behind and heading to Liberia. No funds and no idea how it will all happen. All I know is God is saying step out of the boat and onto the water and I am obeying ! Katie is truly an inspiration. I have been keeping up with your blog, so thank you for writing even when I'm sure you didn't feel like letting all of us in on your life. But every single time I read your blog I am refreshed and reminded of God's love for me. I was a missionary too. Three years ago I taught 4th grade on a small island in the South Pacific called Palau. It was the most amazing year of my life!!! I miss it so much! That's why I love to read your blog. Our experiences were very different, yet I feel connected at the same time. We both accepted God's call to serve Him and fell in love with the place and people that He sent us to serve. Your stories remind me of serving Christ, something that I feel I don't get to do as much here on my college campus. Thank you for allowing yourself to be used by God to reach someone like me, even though you had no idea. May God bless you and your beautiful children. May we meet one day in Heaven to compare stories and remember our days of fulfilling God's great commission. Thank you again and again! May God be praised!! May God continue to rain blessings down on you, your beautiful family, and all the gorgeous souls that surround you in Uganda. God has lit a fire in my heart from reading your book. I've been reading your book this week, and I love your story. Miss. Katie!I'm 15 years old, homeschooled, in high school and taking college classes with a program called college Plus, studying to be a Traveling Nurse, I've always wanted to do mission work in Africa. Never known why just had. Now reading your story I want to go to Uganda. My mom isn't so sure at letting me go so far away my dad thinks that this is just a phase and my brother (13yr old) just doesn't want me to. Reading your book makes me want to go all the more. Just thank you for writing it and doing what God wants you to do. I just am going to say there's no such thing as good timing just God timing. Katie what your doing is so great you have been a role model and a huge influence in my life. After reading your book my first thought was how can I help these people too. I prayed about it and I was excited but then I became less and less excited about it and eventually forgot. Recently I had another experience where I became exciter about helping orphans again. Today I am praying and figuring out a way to help the orphans in Uganda. My favorite color is also yellow. Always has been. I love it as it reminds me of sunshine and (happy) It seems to be a color filled with life. You are filled with that life and you give a little sunshine to other peoples lives. The color fits you. You are a brightness in a dark world and I know those that you visit , help and love are touched by your color. I am soon to be 15, and I recently got back from Africa. I was in South Africa in the Limpopo Valley. Our team worked with refugees and churches we planted there. Let me just say that you have totally inspired me. I want to be like you. I am ready to move over there and give it my all to help out. If God is willing, I will be over there as soon as I can to bring glory to Him. Thank you for all of your encouragement, you will always be in my prayers, Katie! This is Cindy over in California, soon to be a resident of Lubumbashi, DR Congo. I feel as though I've come to know you intimately in your beautiful book and in your blogs. They are a joy to read and so, so encouraging. I hope we can meet, perhaps next June when my husband and I and kids fly up to Uganda for a friend's wedding. I'm not sure how to get a hold of you other than a public blog. But it would be so good to really meet you and your precious girls and the folks around you. Jesus blesses so many through your love and ministry! Your story reminds me of my reading yesterday in 1 Corinthians. Paul was saying how the unbelieving spouse is "sanctified" by the believing spouse. I think what you've described here tells me your little house is "sanctified" by your obedience to Him. Great words, my friend! Either way I just thought I'd say, You are the most impressive and beautiful creature I've ever seen. If that was you at checkpoint charleys I'm sorry for not being ready yet. Soon! You sure do have my attitude though. You've been such an inspiration to me. I read your book and you have touched my heart. I love your faith and trust in the Lord to meet all your needs. I respect your total surrender to the Lord and taking scripture to heart of what we're suppose to do for the least of these. Katherine doing? I've been praying for her healing. Christ bless you and your girls always! I am a 13 year old boy... I read your book and it is really good. I raise money to different mission each year this year I am raising for a mission in Zimbabwe...Ever since last year I have been collecting money for different missions. Last year I collected $250.00 for Operation Christmas Child by making bookmarks, but this year I didn't make anything. This year I am raising money for a mission called Mashindi Medical Mission. Next year Mashindi Medical Mission (MMM) is launching its major project that will have three phases over the course of the next ten years. This project is to build a major hospital in Zimbabwe to serve the local people of the Zaka-Dabwa region. The strategic planning is for the development of Mashindi Medical Mission in Zaka-Dabwa, Zimbabwe which is designed and developed as a strategic plan for the purposes of planning and construction. The strategic plan project is a frame work that is anticipated to be implemented when Mashindi Medical Hospital is established in 2016. In the next four years preliminary work will go on from 2014 to 2016. This plan served as a project proposal for funding from churches, charity organizations, private donors, hospitals and well wishers. The purpose of this project is to meet the needs of the church by meeting the needs of the people through medical evangelism. I just read katies book and I have to say that it made me see my life in a whole different way! My sister said she was hungry and I instantly thought of all the little children who are really hungry. Now each and every day I pray for your family. May God bless you always. May the peace of the Lord overflow your heart today. Your love for Christ and the least of these is remarkable. Praise God for the faith He has granted you. I pray for the same. Its 3:00 in the morning here, and I just finished reading your book earlier tonight. I can't sleep. I came to the computer, decided to take a look at your sites, and found this post. As a mother of two little ones, it struck home. I know you were talking about your life, your kitchen, but it made me think of mine...It made me think of all the days I stand work weary and worn down in that room, making meals to feed my family, from our full cabinets, all too often with a bad attitude. Grumbling because the kids are hanging on me, wondering when my husband will be home from work...not appreciating what God has blessed me with, what I can do there, how he has blessed me so I can bless them, bless others. How I don't want to open my doors, feed another person, because of the inconvenience...which boils down the the unwillingness to serve. I sit here with tears rolling down my face in the middle of the night, with a repentant heart. 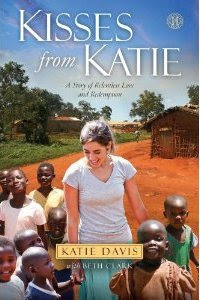 Katie, know that you are not only touching the lives of those babies there, showing them Jesus, but also a housewife and mommy in the middle of the night in Georgia, sitting at a keyboard...your example of how you love your family on each and every page of your book has made me take a long hard look at how I am loving mine...Thank you. Hi Katie, my husband gave me your book as a birthday present this year and I can't tell you how much I have been touched by your life and experiences. As an African living in Europe and now returning home, your story has helped me see what God can do if we open our hearts to him and I am excited to begin my walk of total devotion to his work and his call. Thank you and may God richly bless you and your girls. Katie, In reading the comments just on this one blog I can see you have many fellow laborers in prayer already. But I would like to add mine also. My friend Kathy and I pray together every Tuesday morning at 10:00 A.M. We will pray for you and your children at that time, but also I can pray for you daily. Surely as we commit ourselves in agreement with you there are no long miles between us, for prayer bridges all distance. Katie as I read your book and some of these posts I feel like you are doing our work for us. So the very least we can do is to get under the load with you in prayer. One other thing I want to mention: the relationships you have built and are continuing to build are so real, so completely unvarnished and untarnished and familial. I think it is because you see the running need out in the open (and are so quick to blot it up with your presence) whereas here in the states needs are often hidden and Christian friendships a bit more sanitized so that we are really afraid to let fellow church members see "the real me." I'm thinking as persecution and suffering heat up here, the good part is that we will draw closer together in our common unity in Christ and in our neediness. The body of Christ as described in scripture operates as one. In Him. Bless you Katie. Thank you for working while it is day, for the night comes when no man can work.